conversation between Sam and Frodo at the beginning of their epic journey in The Lord of the Rings by J.R.R. Tolkien. My road trip started just after church this morning. My friend Nancy Pipes, a fellow teacher has joined me for the first leg of the journey. This is great news for me because she is a wealth of information about east Texas. My other travel companion who will join me for the entire journey is called “Riff” the Musical Forest Ranger. We made sure to stop at Whataburger for lunch before we got out of range. Then we stopped at Nacogdoches, Texas where we looked around the old downtown and visited the campus of Stephen F. Austin University. Nancy, an SFA alum, told me that Nacogdoches is the oldest settlement in Texas. (San Antonio is the oldest continuously inhabited settlement. She also shared an old tale of chief Cato (from the Cato Native American tribe). According the legend, the chief had two sons. He asked one to walk to the east the other to walk to the west. The one who walked to the west settled in Nacogdoches, Texas. The one who traveled to the east settled in Natchitoches, LA. Down town Nacogdoches has brick streets and some nice statues. Here is a picture of me standing in front on one dedicated to those who served in the Texas Revolution from the Nacogdoches area. If you look closely at the names listed on the plaque several have become the names of familiar towns and cities in Texas. As we drove up toward Hope Arkansas we passed through the towns or read signs for the towns of Tenaha, Timpson, Bobo and Blair. These tiny east Texas towns and railroad stops were made famous by the singer Tex Ritter who was from Panola County. As we rolled past them we listened to this little bit of Texas swing you might enjoy. 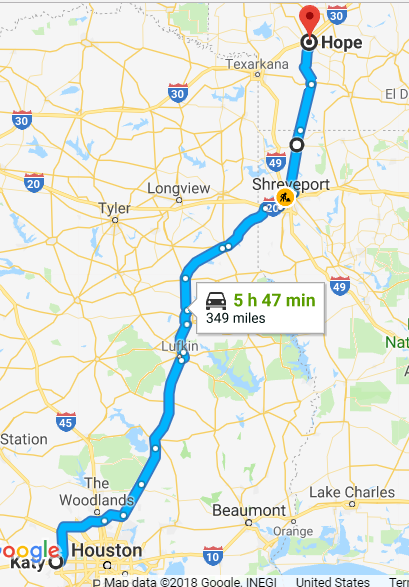 Todays drive included a rainy transition from the big city of Houston through the piney woods of Texas in the sunshine. Just before we got to Arkansas we drove through under a double rainbow and across the Red River.